Is all health care local? View more documents from JohnNorris. I think this slideshow has a ton of useful ideas for a hospital interested in using Twitter or similar tools effectively. Phil Baumann’s 140 Healthcare Uses for Twitter is another good read. When John says “All healthcare is local” that’s true…except when it’s not, just as Tip O’Neill’s “All politics is local” was occasionally trumped by national issues. And social media platforms are, above all, personal. Most of the healthcare people get is local. But sometimes they look outside of their local for specialized expertise. And part of the power of social media is that it makes that expertise available to a community that can be globally dispersed. But as John points out, the social tools (including Twitter) can be extremely helpful for a local community, too. Just because a Twitter community can be global doesn’t mean it has to be, or that the only worthwhile Twitter efforts are those with thousands of followers. Ed Bennett’s list of the hospitals with most Twitter followers was interesting and fun, but as he says, you shouldn’t read too much into it. A hospital with a few hundred followers could be providing a great service and interacting with that local community. The point is to be of service to the community, whether it’s geographical or interest-based. If the information you provide is useful, and if you can interact with that community, the activity can be valuable both to you and to the people you serve. For example, people might want to follow and interact with @mayoclinic AND their local hospital (e.g. @InnovisHealth in Fargo, ND), and maybe a service like John is providing in Corvallis, Oregon called @CorvallisHealth. They would be likely looking for different information from each source, and to have different conversations with each. Twitter lets users (including each hospital/corporate user) decide on suitable goals that meet their objectives. As John suggests, don’t let someone else’s Twitter strategy have too much influence on you. Look at what Twitter can do, and what you can do with Twitter, and decide what makes sense for you. I’m looking forward to learning about lots of other innovative uses of Twitter at the Health Care Social Media Summit Mayo is hosting in October in Scottsdale, Ariz,, co-sponsored by Ragan Communications. If you’re using Twitter in an interesting or different way, I’d love to hear about it and help spread the word about it. By sharing what you’re doing, you may spark ideas in others. Not that they would necessarily do the same thing exactly, but it may help them see connections they could make in their communities. And since most health care is local, you can just feel good if someone in another community can gain from what you’ve learned. Author Lee AasePosted on August 18, 2009 Categories Health Care, TwitterTags Ed Bennett, Global, John Norris, Lee Aase, local, Twitter3 Comments on Is all health care local? Note: This course is part of the general education requirements for Social Media University, Global (SMUG). A wiki is a great tool that enables groups of contributors to work together to quickly create and edit documents that pool their collective knowledge. You’ve no doubt heard of Wikipedia, which is (to paraphrase the former Iraqi dictator) “the mother of all wikis.” The richness of this resource, produced entirely by collective voluntary effort, is truly amazing. Check out its entries on the Virginia Tech massacre and the 35W bridge collapse, and you’ll get a sense for the power of wikis to facilitate collaboration. And these are only two of the more than 2.2 million articles in the English version of Wikipedia. So just how is Encylopaedia Britannica supposed to compete with that? But how can wikis help you complete your projects? If you have a work team, you can use a wiki to produce documents much more quickly and easily than you can with a Word document via email. For example, say you have a 10-member team and you need to produce a two-page document. In the old way (or maybe what you’re doing today), you would produce a first draft and send it as an email attachment to your team members: Ann, Bob, Cindy, Doug, Eunice, Frank, Gail, Hal, Irene and Joe. You play it smart and turn on the track-changes mode, so edits are apparent. Ann adds to the document, hits “reply all” to the email, and sends her revision to the whole group. Bob bounces your original directly back to you with some modifications, but doesn’t copy the rest of the team. Cindy changes Ann’s version and hits reply all. Doug deletes Ann’s additions and inserts his own, and likewise sends to everyone. Eunice edits your original and sends it on to Frank for his thoughts on one particular section. Frank fails to respond, so Eunice’s edits are lost to the team. Gail groans at Cindy’s changes, adds her own ideas, and copies the whole team on her changes. So at this point in this illustration you have 52 Word files in various team members’ email inboxes, and figuring out which is the latest version is, well…problematic at least. And even if you can track down the various versions, it’s a hassle to compare modifications in separate documents. That’s why wikis are wonderful. Instead of sending an attachment, you send a link to a special Web site. You and your teammates make your edits in one common place, and each version is saved in the document history. So you capture all of the information, and you as the editor can compare the various versions. 2. Participate in our Class Wiki Demonstration. Visit the SMUG Curriculum wiki, and add your course ideas. This gives you hands-on experience with a wiki, and it also will help strengthen our curriculum. 3. Set up a wiki for your team or some other group. You have options to get these for free, like everything else in the SMUG curriculum. The one I picked for our class project is wikispaces. Using wiki technology to accomplish a practical project takes your experience to the next level. 4. Discussion: Please share your thoughts or questions about wikis, or what you’ve learned through your experiences with them, in the comments section below. Extra Credit for Honors Students: Read this review of Wikinomics for broader background on the new ways of working made possible by technology like wikis. 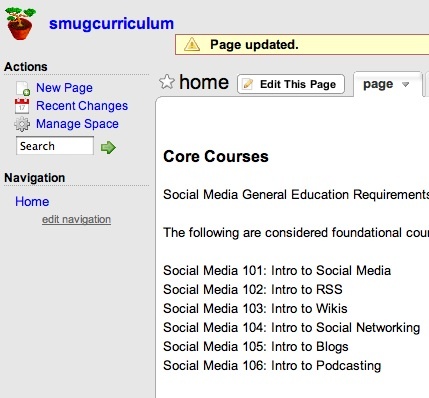 The Board of Regents has given approval to development of the curriculum for Social Media University, Global (SMUG). Additional Majors will be coming soon. And although you can choose among various major tracks, the best news is you don’t have to pick just one. You can do them all. Your second and subsequent majors are included at no additional charge. They’re included in your base tuition. For more information about SMUG, click here, or go here to enroll. Social Media University, Global (SMUG) is a natural extension of my family’s interest in education and the development of the Internet, as well as my experiences in speaking to conferences of professional communicators who are interested in exploring how social media relate to their jobs. My Dad was an elementary school teacher before becoming a principal, and upon his retirement served a term on the local school board. I graduated from college the traditional way in 1986. But since then, we’ve taken a decidedly non-traditional approach to education. In fact, SMUG’s headquarters facility, Old Main (pictured above), doubles as the headquarters for Aase Academy, a primary and secondary school that has seen its first two graduates go on to complete their four-year degrees at University of Wisconsin, La Crosse. I am the Superintendent of Aase Academy, and my wife Lisa is the Principal and Master Teacher. Unlike SMUG, Aase Academy is an exclusive institution: you need to be born into it. Accredited, certified, standardized degrees obviously have a place. My brother, Mark, graduated from college last year through a cohort degree-completion program that involved substantial on-line interaction and distance learning. He got a management job largely because of it, and was chosen to give the commencement address, which you can see here. But while a degree (maybe even an MBA) may be a requirement for a particular job, it’s generally just a minimum price of admission to be considered. What matters even more is demonstrating what you can do and the results you can deliver, and how you continue to learn and grow and develop new marketable skills. This leads to discussion of another type of learning that I view as necessary and beneficial, but not quite sufficient. Many professionals attend conferences and seminars for a quick immersion in social media. I enjoy attending and speaking at these because they give opportunities for face-to-face interaction, and I highly recommend them. But if you spend a couple of days and hundreds or even thousands of dollars at a social media seminar, but then don’t apply what you’ve learned personally and professionally, you have developed familiarity with social media but haven’t really experienced it. That’s where Social Media University, Global comes in; it provides an ongoing framework for structured learning about a field that will become increasingly important for professionals, particularly in communications, sales, marketing and management. SMUG uses social media to help you learn social media. So you aren’t learning alone; you’ll be part of a group that is learning together. And it’s not a theoretical, ivory-tower curriculum. It’s real-world stuff. SMUG is not accredited by any higher educational body, so therefore the credits you earn don’t transfer. The learning does transfer, however. You can apply it immediately in a hands-on environment to your personal or organizational projects. You can subscribe to the SMUG feed directly here (assuming you’ve completed Social Media 102: RSS Feeds) so you’ll be made aware of new posts. Join the SMUG Facebook group. That group will serve as the virtual Student Union for SMUG. You can upload photos or videos, or post links to your projects, and otherwise network with people who share this common interest of learning about social media. Follow the Chancellor on Twitter. While SMUG’s headquarters facility, Old Main, was completed over a century ago, our curriculum is definitely under construction. Please join us in building it out. Associate professors are welcome to join the faculty. Compensation is the same as tuition.